Waynesville, NC author William Johnson Everett has published eight books and numerous articles on social ethics and religion. He taught for over thirty years in Germany, India and South Africa as well as in the United States. For his novel, Red Clay, Blood River, he has drawn on the simultaneous occurrence, in 1838, of our own “Trail of Tears” and South Africa’s legendary “Great Trek” to tell a sweeping saga of love and conflict in the midst of migration, invasion, slavery, and exploitation. The story, told by Earth, braids together the lives of an African slave, the settlers of Appalachia and South Africa, and three contemporary young people struggling with this fragmented heritage of courage and pain. Everett has joined with actress Barbara Bates Smith to cast parts of his story into dramatic readings that introduce us to the power and lyricism of Earth’s voice and the character of these remarkable people. Smith and Everett have drawn standing room only crowds to these performances. 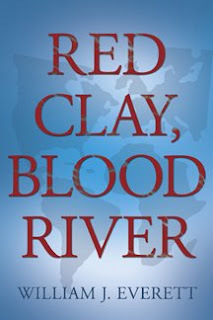 For more about the book, readers can visit http://www.redclaybloodriver.com/. Forests of the Night by James W. Hall. St. Martin’s Minotaur, 2005. 341 pages. In recent years an increasing number of writers have been drawn to the tragic history of the Eastern Band of Cherokee Indians as a kind of literary vehicle. Although the plight of other Native American tribes equals (and often exceeds) the shame and pathos associated with the Cherokee Removal, it is a kind of historic parable — a tale that reveals the hypocrisy beneath the Great American Dream. James W. Hall, a successful writer of “crime fiction,” normally sets his suspenseful action tales on the Florida sun coast. Best known for his depiction of ruthless psychotics, Hall’s protagonists spend much of their time cruising bars and coastal inlets, alternately trolling for tarpons and ruthless drug dealers. Hall is at his best in familiar territory: sun, sand, sultry vixens, crisp dialogue and tequila in the Green Flash Bar. However, this time out, he opts for the foggy coves of the Great Smoky Mountains and a dark secret that originates with the death of T’sali, the Cherokee martyr. Instead of Thorn, the aging beachboy, Hall’s protagonist is Charlotte Monroe, a dedicated Miami cop with a phenomenal gift for “reading faces” — the fleeting twitch or facial flicker that telegraphs a suspect’s intentions. Will he cower or attack? As a consequence, the FBI will resort to anything (including blackmail) to acquire Charlotte’s services in tracking down wanted criminals. However, Charlotte’s life is complicated. She is married to Parker, a highly successful criminal lawyer (think Johnnie Cochran) who believes that everyone deserves a second chance, even if they are guilty. He is also a descendant of a noted Cherokee family. In addition, Parker and Charlotte have a schizophrenic teenage daughter, Gracey, who spends much of her time (when she is off her medication) discussing her future as an actress with Joan Crawford, Stephen Spielberg and Barbara Stanwyck. Now, to this heady mix, Hall adds an explosive catalyst: a blond-headed Cherokee named Jacob Panther who is on the FBI’s “Most Wanted” list for murder and terrorist activities (blowing up banks) — and who just happens to be Parker’s son, the consequences of a youthful fling at a mountain retreat called Camp T’sali near Cherokee. When Jacob arrives in Miami with a lethal blowgun and a stolen truck, it appears that he has come to kill his father. Instead he has come to (a) seek his legal advice, and (b) to warn him that his name is “on a list.” The eavesdropping Gracey learns that she has a half-brother. When Charlotte calls the police, Gracey warns Jacob and when he flees back to Cherokee, Gracey follows him, Charlotte and Parker follow Gracey and the chase is on! The ensuing action may strain the credibility of some readers. It certainly strained mine. A lurid, fantastic story unwinds involving revenge and retribution. When Parker’s mother (who is a Ghigau or “Beloved Woman”) is murdered with a stone hatchet stolen form the Museum of the Cherokees, and the grieving son discovers a cryptic clue written in the Cherokee language (Sequoyah’s syllabery, no less!) the Monroe family descends on Cherokee with a gaggle of FBI agents in hot pursuit. The investigation does not go well. The hallucinating Gracey ends up in a trailer with Lucy Panther (Jacob’s mother and her father’s old flame), while Parker and Charlotte check into the Holiday Inn. Cherokee seems to be a dreary place, filled with sullen people, doomed elders and sleazy craftshops. However, regardless of how stressful the search for Jacob becomes, the Miami duo has time to occasionally lift their eyes to the fog-shrouded Smokies and marvel at their beauty. There is a visit to “Unto These Hills,” which is a disappointment, although Charlotte manages to shed a tear at T’sali’s execution. (Apparently, the author saw the pageant before it was “revamped” and T’sali’s martyrdom was edited out.) There is also a visit to a tribal nursing home to interview a tribal elder named Standing Dog, and a bizarre visit to a fanciful institution called Asheville Woman’s College where a mysterious guardian of the tribal rolls keeps the fateful “list” — the names of T’sali’s descendants who are marked for execution. I won’t give away the final revelation about the assassins; however, I can’t resist mentioning the “killer poodles.” Yes, that’s right. White Poodles. They are a bit over-sized, of course, and have been trained to kill at a signal from their owner who just happens to be the Cherokee Police Chief, a white man and a really sick puppy in his own right ... with an Elvis hairdo. Believe me, this is all just too good to miss. Promise not to laugh, now. Plagued by insomnia, I got up around 6:00 one morning last week and went out to sit on my deck so I could watch the fog rise in my garden. In the dim light, I saw two young foxes playing in the freshly plowed dirt.They reminded me of kittens as they tumbled, wrestled and rolled in mock combat. Then, a plank in my deck creaked under my foot and they froze. They stared at me for an instant and then vanished, melting into the fog and undergrowth. For a moment, I felt very privileged … even honored, you could say. Last year, while I was visiting a friend on the ridge behind Wal-mart, I came on a flock of wild turkeys standing quietly in a large grassy field. As they moved slowly across the field finally vanishing into the woods, I noted that in the background I could see clouds of dust, and I dimly heard the grind and thunder of bulldozers that were altering the shape of land along#107, converting meadows and farmland into acres ofconcrete. I asked my friend about the turkeys. Recently, another friend of mine told me that he had been vainly searching for “the smoke hole” in the Tuckaseigee community. “It used to be a kind of tourist attraction forty years ago.” He wondered if perhaps it had been bulldozed out of existence and that troubled him. He went on to note that in the old Cherokee myths, hunters who stood near the smoke hole in winter when the warm air melted the snow for a distance of five feet around the hole – those hunters claimed they heard drum beats and distant laughter. Just across the road, my neighbor has erected a huge sign that announces the sale of 34 acres of land. Who will buy it? What will they do with it? How will it affect my life? Two years from now, will I recognize the ridgeline of the woods across the road, or will it be transformed into condos, summer homes and convenience stores? Will the smell of honeysuckle and the trill of birds be replaced with the aroma of charred meat and the din of traffic? Sitting on my deck, watching the shift of light from night to day, I have the definite feeling that we are all – foxes, wild turkeys and my neighbors – standing on the boundary between two worlds…. And we are facing eviction. Where will we go? Gary Carden graduated from Western Carolina University near Sylva, NC. He taught literature and drama for fifteen years, worked for the Cherokee Indians for fifteen years and has become well-known as a playwright. His popular play "The Prince of Dark Corners" has been made into a movie and has received high ratings from around the state. 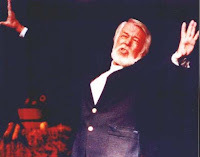 To learn more about Gary Carden, see his website, www.tannerywhistle.net. I live in an old farmhouse that is literally falling apart. Each spring, clouds of termites rise in the bathroom and the bedroom, coating the windows and covering the kitchen stove and the mirrors in the bathroom with tiny wings – wings that clog my vacuum cleaner for weeks. In the winter, the wind woofs in the eaves, pours through the attic and seeps into my bedroom like an ice-laden river. All of the doors hang off-balance and a tennis ball, dropped in the living room will roll slowly from room to room – like a cue ball looking for a pocket – until, eventually, it find its way to the kitchen, always coming to rest behind the sink. But, with each passing year, my affection for these canted floors and leaning walls deepens. 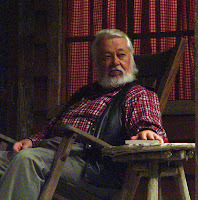 I came to live here when I was two years old, and now, seventy years later, I still sleep in the same bedroom – the one my Uncle Albert dubbed “the North Pole.” The entire house bears testimony to the lives of my grandparents, and when I walk from room to room, I hear lost voices and sense fading warmth. Just here, beneath this old flue, my grandmother tended her Home Comfort stove. And over there, on that cracked cement hearthstone, that once fronted a fireplace, I used to lie whimpering on winter nights – my cheek pressed against the warm hearthstone (I was plagued with chronics earaches) while my grandmother poured warm cod liver oil from a tablespoon into my ear. There, where my computer now sets, my grandfather used to tune the old Silvertone radio, listening to “Renfro Valley” on Sunday mornings. It is also where his coffin rested (for I lived in a time in which the dead came home for a final farewell). The old house seems to be slowly sinking into the earth, dragging with it a roofless canning house and a derelict barn. Yet, there are brief moments – usually in the morning – when this dim space seems filled with a kind of tangible energy. There are mornings when I wake in the chilled air of my bedroom, sensing that I am not alone -that this empty shell has become an echo chamber. In the kitchen, my grandmother’s Home Comfort radiates warmth while she conjures red-eye gravy from a black skillet; cathead biscuits bloom in the oven and a tin coffee pot chuckles on the back burner. I feel my Uncle Albert’s discontent (he suffered from migraines) as he sits leaning back in a cane-bottomed chair at the dining room table, his chair legs gouging little half-moons in the linoleum. My grandfather is milking the cow, and any minute now, he will stomp into the kitchen with a bucket of steaming milk. From the living room comes the strains of Jo Stafford’s “You Belong to Me,” followed by the banter of Reed Wilson, WWNC’s popular early morning d. j. See the jungle when its wet with rain. But when my foot touches the floor, it all vanishes … recedes like an ocean tide withdrawing down the corridors of the years; carrying away warmth, biscuits and my grandmother’s hands through the draft of a broken window. Sometimes, I move quickly to the barren kitchen, hoping to capture a belated fragment of what was here a moment ago – perhaps the last vestiges of Albert’s complaint lingers. (“Ahhh, God! I didn’t sleep a wink,” he says, as he massages his head). And here…who is this tow-headed creature in his peppermint striped pajamas? My God, it’s me! I’m on my way to Albert’s bedroom, where I will find a stack of lurid magazines beneath his pillow…Captain Marvel, Plastic Man, Black Hawk and The Blue Beetle. Is it possible that there are past moments that have taken refuge in these rooms? Are there moments that were fueled by such intense emotion, they hang suspended like banks of summer clouds, waiting for an alignment of hours, months and memory? My mother’s grief for my father’s murder is somewhere in this bedroom; my grandmother’s loss of a “blue baby;” the return of two sons from WW II haunts the front porch; an old, broken fiddle that played “The Waltz You Saved for Me” resonates faintly in the attic – are they all here like eavesdroppers in the next room, waiting for their cue to enter? floats in the summer darkness. Then, children’s footsteps will mingle with the slow trudge of the elderly, and blasts of snow, wind and heat will batter these walls as spring and winter collide and this old house finally explodes leaving nothing behind but the buzz of a solitary wasp freed from its prison behind an attic window. Finally, this old house will mingle with fog and moonlight, drifting through the stand of hemlocks that encircles this dim cove where my homeless spirit will rise to meet the morning sun.